The words I share with you come from an email sent to me years ago, after I’d lost both my parents suddenly, was let go from my job, robbed within weeks of returning to Greece and had a mere .50 to my name. Because I no longer had a computer or money to visit an Internet cafe, it would be a month before I read these words, and I’ve found comfort and inspiration in them at least a few times since. I revisit them today not for me, but for friends worldwide who have suffered much since the start of 2008 and were generous enough to share their pain and loss with me. Though death has been an intimate part of my life since I was 10, I will never pretend to know how anyone feels, nor conjure the perfect thing to say because each loss is uniquely personal. All I can do is love my friends, pray for their peace and healing, and keep kind thoughts in my head as they forge new chapters in their lives. I also revisit them for friends who have much to celebrate. As a testament that there is no death without resurrection, I have learned in the last days that the time to say goodbye to three friends is a reality. All are from California, all are Greek-American, all have decided to leave the cradle of Greece and return to careers, homes and futures in America. In hearing them talk about ‘why’ — which I know too well — the conversation is comfortable, but also difficult because the frustration surrounding my overdue and now complicated departure then surfaces. Pain somehow becomes more palatable when you are looking into the eyes of someone who mirrors your own. Yet, in the sadness of no longer having them here, something greater will be gained, namely the happiness and growth they deserve and everything good this journey called life has to offer. 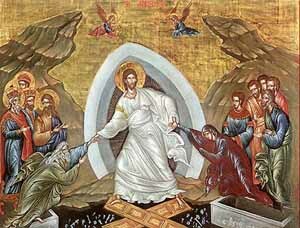 Pascha is not only a time to mark the death of Christ and His resurrection, but also a time to reflect on our own resurrection. * I dedicate this post to my friends NK, SN, JP, RK, RO, JG, N and RB, and DN, MM and NK. True, so very true! Both for the people one leaves behind and for the one leaving. The location doesn’t really matter, it’s that feeling of leaving family & friends back. M – I’ve been fortunate because many of my friends have a world view and are nomadic; the majority are not in GR. We’ve been able to sustain and build relationships from afar, with occasional visits merely enhancing what we have. When we’re young, there’s a tendency to believe that collecting 100-200 friends is where it’s at. When you grow wiser, you understand that keeping a few dozen (if you’re lucky) and investing energy into those is much more worthwhile. I worked and sacrificed greatly for my dreams to come true, and my time in GR has come to a close because I’ve accomplished everything I set out to do. So on that front, I wonder not and want not. For me it’s not about comfort, it’s about furthering a career that’s important to me and building a life that both contributes and means something. I have none of that here and never will. Our time to leave will also come. R – My belief is that true friends find a way to stay connected somehow, with effort coming from both sides. I intend on keeping these friends, and who knows? Maybe we’ll be together again. Death on the other hand is permanent, and there’s a creative process that takes place in finding a new way to live after the foundation has been shaken. I’m not a strong person, but thank you for thinking so. I think it’s more a matter of confronting, adapting and accepting whatever comes my way according to values and principles I set forth. I realize this post is serious, but it is Holy Week. I was just about to cry. Last year I lost someone close to me. The loss was important, but I like the way I got rid of the “bad mood” that these things come with. I guess the idea of “not getting stuck” in the past helped me a lot. It hurts but you have to let it hurt you, and then just enjoy the next day of your life. That’s why I try to enjoy every day of my life. I try, and I don’t always do it, but there is always something or someone to be happy for. I’m in Greece and I realize that life here is hard because of many things (this is not the space nor the moment). But the future is bright, the idea of not knowing what’s gonna happen tomorrow makes life more interesting and helps not to give up. On May 4 it will be 3 years since I lost my dear father. It has been the hardest 3 years of my life, in which I thought if he and his strength is gone, who am I? In that time a close friend divorced her husband of 20 years, by her choice, and lost her mind. Needless to say, I had to let our long friendship slide due to her toxic bi-polarism. Unfortunately, or not, I count my friends on one hand, but I had my own problems to deal with. Saying goodbye is difficult whether by choice or not. If I could run away to Greece today and live in a cave I would, but it’s not happening. Sad things happen and to rise up from the ashes can be, at times, a slow and deliberate process. This Holy Week seems the same as these slow steps in my life right now, every day a different sense of grief I have to wade out of toward rebirth. Maria V – I wanted to add something, and I think you’ll understand what I mean. When you lose someone suddenly and tragically, it’s different, isn’t it? For example, when someone is quite ill or older, there is foresight and you can prepare yourself, talk to them, say goodbye or at least slow down and know that their time may be coming. But when someone is young, strong, healthy and suddenly they’re gone, you fall through a trap door and must somehow find a way to catch yourself. It took some time for me to deal with the shock before I could even get to the grief — I never thought I’d be the oldest person in my family at such a young age. It’s been a huge lesson in acceptance. My mom was 57 when she left and my dad 62, and I’m grateful to have spent even one moment of one day in their company, so in retrospect, 30 years was a very long time. G – There’s nothing wrong with crying once in awhile, it can be very cleansing and cathartic. You are a very joyful person, and I think many who know and live this kind of happiness have also been very sad. These opposites live side-by-side. Maybe that sounds philosophical, but it’s true. There was a time in my life when I lost my grandfather (my role model), my best friend and nearly my own life in 60 days. And yet, I could understand there was still joy in small things — a home, food, friends, health, sunlight, stars…life itself. So I understand what you mean when you say there is always something to be happy for. There’s a saying that goes something like: If a man is not happy with one, he will not be happy with two. D – Everyone deals with grief differently. What I’ve learned time and again is there is nothing to “get over.” And what I mean by that is this person impacted and molded your life, so they will always be an integral part of who you are. In that way, there is nothing to get over. That’s also what I mean about the creative process, letting your life come back together in its own time and in new ways. I love life too much, which is why confronting, adapting and accepting really work for me — I run from nothing, I embrace things that frighten me, and I smile at my enemies. What works for you may be very different. There are times when we must let people go, by mutual choice or not. Some things do come to a natural end. Sto kalo! Superbly written. The best writing is always from the heart. To live is to experience death and loss. Unfortunately it is an unavoidable fact of life. Two things make it bearable. Our faith in God and the loving support of those kind souls around us. you’re right about losing someone unexpectedly. i lost both my parents knowingly – they were both very very sick in their last days; their death was simply the inevitable. by staying in greece, i also feel i’ve lost the chance to live the kind of life i had always to live, (academic, serious), but i have never regretted staying here. sometimes i feel i don’t belong to this place, even though my parents were both born in hania, but i’m still here. Καλό Πάσχα και Καλή Ανάσταση Kat πολλά φιλιά! I’ve read this post quite a few times and don’t really know how to put into words an appropriate and fitting response but I know I echo the sentiments expressed by the commenters above. “Run from nothing, embrace the fear, smile at my enemies” , truly great ideas to live by. Thank you for this post and the strength you’ve given me today. George – I received your message, however your request was not specific and I do not dispense advice on the USA. There are already plenty of websites filled with good, reliable information out there. It’s not a matter of ignoring you. It’s a matter that I have thousands of readers and not enough time — I started this site to stop requests for personalized advice and make a resource accessible to everyone to help themselves. I have a full-time job, a part-time job, this site (another part-time job in which I am not paid), a family and not enough time to give attention to close friends I’ve had for decades. If you’d like to ask something specific, post back and I’ll write you a reply. Thank you for your kind offer, but I have my own connections and have plans to leave GR so I won’t need them. Kalo Pascha! It is interesting that you suffer for Greece more than many of its citizens.As one greek poet said ”wherever I go,Greece hurts me”. this is what Easter means to me mostly, because i’m not religious; i’m an atheist. for the past 15 or so years i have outright refused to go to church for this occasion, or any occasion, unless it’s a a wedding/funeral etc, and even then, i will attend begrudgingly. although most Greeks may not necessarily be ‘outwardly’ religious, in their behaviour and mannerisms, the sentiment, and general belief, runs (somewhat) deep–if hypocritically–and this puts me at odds at with the entire culture to some extent. Easter is a great time to catch up with family, friends, and loved ones, and to reflect on our lives and the direction in which they are heading certainly; but not for religious purpose. Although my own family is pretty religious (Protestant), the whole Greek religion thing just irritates me. I think it is because it is so superficial: I never hear anything about the meaning of Christianity, or the teachings of Christ. Instead, we get this Greek propaganda allied with egocentric individual behaviour. Frankly, I think we’re better off without this hypocrisy. SN – We’re thinking of you, A and the boys. MV – To me it’s understandable you live here. You are connected to this country, you have a house, you live on an island and your family is here — I envy that. None of those things are true for me and never will be, plus my fiance wants to leave and has his family’s blessing, so it makes sense for us to go. It is also necessary because we will be supporting his parents in retirement since the pension system will eventually be bankrupt (I don’t say so, Greek economists predict perhaps in 5 years if no reforms are made), and they have no savings or property of their own. ED – No words necessary, your acknowledgment and friendship are more than I could ask for. K – I’m not suffering. I’m doing fine and life is good. B – That’s true, any day of the year is a great time to meet with friends and family, and I believe resurrection can take place anytime. My fiance and I consider ourselves spiritual and not religious. He’s baptized Orthodox (which of course was not his choice), but doesn’t go through the motions for the heck of it or fall to family pressure. He also does not pretend to know what it means or why. That’s honest, and I can get on board with that. Certainly, people can be spiritual without religion, and religious without spirituality. M – It’s interesting you should say that because when I speak to people about their religion, most have not a clue about Orthodox Christianity or the meaning behind customs and traditions that are rooted in it. So why do it? When I did the New Year’s post, I had to do my own research because a few people had bits and pieces but not the whole pie. When I worked for the Archdiocese, I did so with the intention of learning and the possibility of embracing the religion. Ironically, the more contact I had with people proclaiming themselves devout (priest, hierarch or not), the more I wanted to get away from it. Religion and the meaning behind it are fine — it’s the way people interpret and use it improperly. (People should understand I’m not singling out or criticizing anyone because I think it’s widespread across all religions and countries).